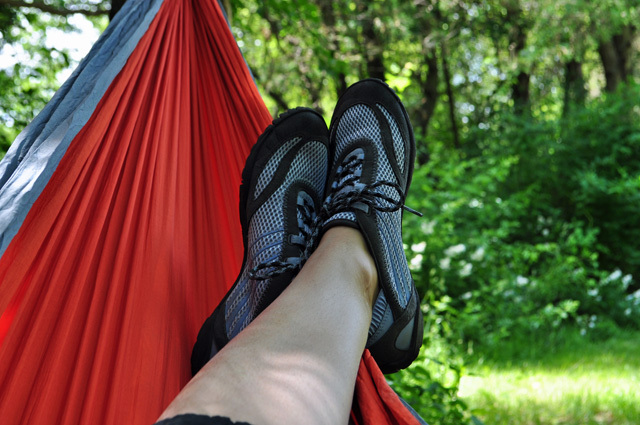 If you have been following this blog for a while then you are aware of my affinity for Merrell and their wonderful Barefoot shoes. Both Josh and I have owned a number of their “glove” offerings, the minimalist sole is supportive without being heavy, I feel more balanced and move faster in them while working. However I have started running again and could feel my feet start to fatigue after about two miles while wearing the pace glove. I don’t want to go back to a structured running shoe but also don’t want sore feet. Minimalist shoes really work for me, they are not ideal for everyone. I did break down and purchase a new pair of shoes but was never really happy with them, especially after a 5K in them. While shopping for new hiking boots I saw something exciting, the newest evolution from Merrell, Bare Access. Had a great 2.5 run in my new @Merrell #BareAccessUltra. Been a fan of the #paceglove forever but these are the best #minimalist I've seen!!! They are AMAZING!!!! Just a slight upgraded sole, some additional arch support but still very light. My feet feel no fatigue and still feel very connected to the ground. Plus they are cute, I am actually amazed at how well they match just about everything. I wear they not just to run but also at work when we are setting up events. I found that after switching to a minimalist shoe I moved much safer at work. You feel you steps and I don’t trip over things and can move better around the gear as we are working. This is just my option. If you have tried a bare or low profile show before but found them lacking I would recommend giving the Access series a try. This entry was posted in Going Barefoot, Product Review and tagged Bare Access, Barefoot Shoes, Go Barefoot, Going Barefoot, Merrell Barefoot, Merrell Shoes, Minimalist Shoes, Pace Glove, Product review, Running Shoes. Bookmark the permalink. I feel your pain. I walk over 20 miles a day and support for my feet is very important. I have been wearing Avia’s. They have extra support for those that have high arches. Years ago, I wore Brooks. They were very light weight.